FREE ReNu Contact Solution w/ Coupon! 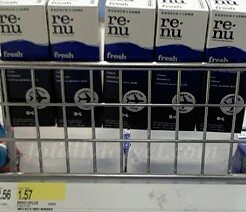 A lot of Target and Walmart stores have 2oz ReNu for around $1.50-$1.57. Use this $2/1ReNu Fresh Multi-Purpose Solution coupon (no size restrictions) to get it for FREE! Thanks, Mojo Savings for photo!